COLUMNA MESSIANIC RESEARCH CENTER: The BEST INVESTMENT IN YOUR LIFE IS YOUR LIFE! Here Are Tips On How To Have The Best And Wisest Investment You Could Ever Have! The BEST INVESTMENT IN YOUR LIFE IS YOUR LIFE! Here Are Tips On How To Have The Best And Wisest Investment You Could Ever Have! OUR LIFE HERE ON EARTH IS AN INVESTMENT! A wise servant, son, or daughter of God invests the talents and time God gave him/her in things that are of great value and long-lasting, not only in this world, but especially in the AFTERLIFE or the NEXT WORLD. In planning for business or careers, we should focus them in the direction of our role in God's Kingdom. Our talents must be used and developed (the parable of the talents). Our thoughts, speech, and actions must conform to GOD'S standards, and they must clothe us in righteousness; so we can have the proper wedding garment at Christ's return (Mat 22:11-14). The main purpose of our life and existence here on earth is to develop and embed in our character the image and likeness (Tzelem Elokim) of God the Father, as modeled by Jesus Christ (Gen 1:26). And GOD gives each one of us, only about 2 hours to do this! Without realizing this, we could spend this precious life in vain; as most of the people in the world are doing. While most people spend their time in entertainment, in their careers, business, and many other worldly "success," why not spend your time and life exclusively for the development of that Godly and Righteous character patterned after CHRIST, within yourself? Yes, you can still have your success here on Earth, but it should be subordinate to your success in the next world. OUR LIFE IS AN INVESTMENT. THE BEST BUSINESS INVESTMENT IN LIFE! Our life here on earth is an investment. A wise servant invests the talents and time God gave him/her in things that are of great value and long-lasting. Remember, our individual life's clock is always ticking, and very soon it will run out and stop. When you look back to your past life, will it give you satisfaction and fulfillment? If you are still young, start now to always remember God in your early age, as early as possible (Eccl 12:1). Before the evil days come; namely, calamity and old age, when one can no longer serve God, as in youth. (Eccl 11:2,8). Ecclesiastics 11:9,10 show the youths what things to do and what to avoid. Youth is the most critical years of every human being. These are the so-called formative years. 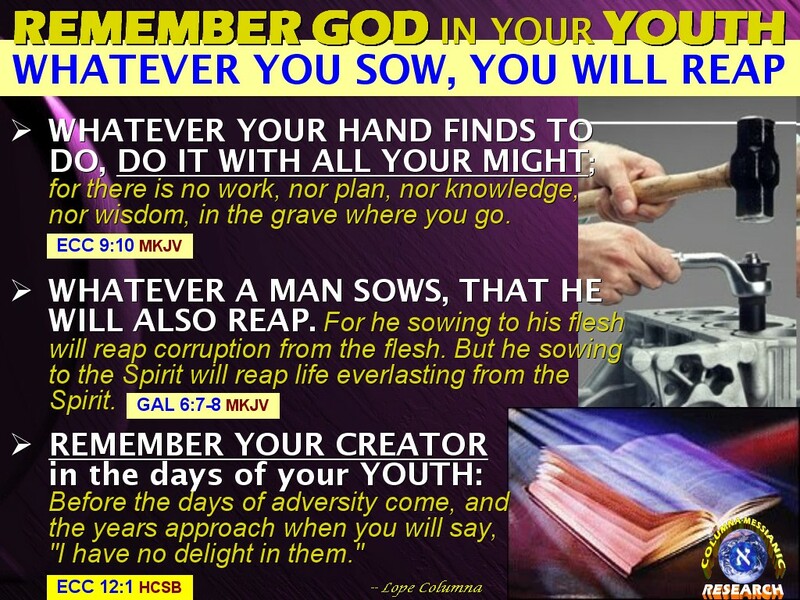 Youth is also the time of sowing "seeds." Whatever seed you sows, whether it is good or evil, that's what will you harvest in the future. So, be careful, and don't be deceived with youthful lusts and pleasures. Remembering God in the days of youth will make the youth physically and spiritually strong and successful. God's laws and principles of life will guide the youth to avoid temptations and foolish things. Most important, you start young to build godly character. As for me, I started to know and remember God when I was 19 years old, when I read my first copy of the Plain Truth magazine that led me to the Bible. Studying the Bible really changed my outlook in life, which helped me overcame hardships in life, and be successful through the years even in my career. Now, I'm of age, but I cannot forget the many wonderful and even miraculous things God had performed in my life since my youth! If you don't start now, you will despise God's ways when you are old. Generally speaking, It will be hard for old adults to accept changes or new revelations, especially God's Messianic Kabbalah wisdom. But if there are no changes or revelations, there are no Growth and Life. Morality is now of low priority in the world; but to the people who strive to obey GOD, morality is of a very high priority and value. Learn to protect and preserved godly moral values. This is one of the great achievements that you can happily present to your Creator. Preserving and maintaining your moral purity is greater than reaching the summit of Mount Everest! Even greater than landing a man on the moon! Another important thing that every child and youth should learn is that important respect for authority. In other words, don't rebel. If you are already old, or even if you are still young, then redeem the time, for the days are evil. Time is one of the precious things in life that passes only once and never return. REDEEM = EXAGORAZO. To buy up, i.e. ransom; fig. to rescue from loss (improve opportunity). Time is a great resource given us by God, and it is misspent and lost when not employed according to his design and will. If we have lost our time heretofore, we must double our diligence for the future. People are very apt to complain of bad times. It would be better if that stirred them more to redeem time. Ignorance of our duty, and neglect of our spiritual conditions, show the greatest folly. Today, one of the most time wasters is TV. Another is the computer with the Internet. Another is the computer with the Internet, especially that of FACEBOOK and other social media. Don't waste your time by watching too much TV, or engaging in too much entertainment, or too much computer and Internet games. YOUR TIME IS YOUR LIFE! So, if you waste your time, you are actually wasting your precious Life! Yes, we can still watch TV and movies, or use the Internet, but we should make sure that they will teach us something good, lessons of life that will build you up. This means that watching TV or movies, and becoming an Internet "addict" should help and contribute to the development of God's holy, righteous character in us. We must spend most of our time increasing in the grace and knowledge of our Lord Jesus Christ. We should spend our time in developing our useful talents and skills. If we don't have skills, opportunities abound today, where we could acquire one or two. DO = ASAH. To do or make, in the broadest sense and widest application (as follows): accomplish, advance, bring forth, be busy, have the charge of, finish, follow, fulfil, govern, maintain, prepare, provide. We should always work because the idler the man, the busier the tempter. WE ARE LIVING IN THE VERY EXCITING AND CHALLENGING GENERATION TODAY! Don't Lose the Opportunities! We were born in the very significant period of human history. Our birth and existence under the sun today are very different from all the other human beings before. We live in the very critical period of human history -- the end of the end time. The time where nuclear tribulation could occur. The time when major prophecies of God are being fulfilled in our very own eyes almost every week. BATHE AND WASH YOURSELF CLEAN IN THE OUTPOURING OF THE HEAVY RAINS OF GOD'S MESSIANIC REVELATIONS! And today, God is pouring out high and heavy revelations from heaven like heavy rains! These are the deep secrets of God, called the Messianic Kabbalah Wisdom. God is pouring out His spirit of Wisdom in this last generation more than any generation in the world since the first man was created. This is because the Messiah is about to return and redeem mankind! There are so many doors of opportunities and challenges that our God is opening to each one of us today! Wasting youth and time for trivial and non-essential matters is a very big and serious mistake that one can do in this 2-hour lifespan! We are expected by God to overcome, to be a part of the Bride of Christ. And yet God has given us only less than 2 hours to accomplish such feats. Can we cope up with the pressure and challenge? Remember, we are told to do these things with all our might. In planning for business or careers, we should focus them in the direction of our role in God's Kingdom. Our talents must be used and developed (Mat 25:14-31 -- the parable of the talents). Our thoughts, speech, and actions must conform to GOD'S standards, and they must clothe us in righteousness; so we can have the proper wedding garment at Christ's return (Mat 22:11-14). Back to Part 1: YOU ARE GIVEN ONLY 2 HOURS TO LIVE! (Prov 20:30 NRSV) Blows that wound cleanse away evil; beatings make clean the innermost parts. A long time ago when people were still savages (in the year 2003) the US began running some non-domestic prisons by these Biblical principles, that beating and wounding people is really swell. Elisha was an important figure in the Old Testament. He inherited the mantle (a sheepskin outfit) from Elijah which made him God’s favorite. And Elijah, you remember him don’t you? He’s the one that had dozens of men burned to death to show them that he was a man of God (2 Ki 1:10). He’s the guy that didn’t fool around with dying and being buried, but instead rode a chariot pulled by burning horses straight up into the sky where everyone at the time mistakenly thought that God lived. Elijah also had the power to lay hands on dead people and bring them back to life. Elisha however did him one better. Elisha’s corpse brought people back to life after Elisha was dead and buried in a grave (2 Kings 13:21). Elisha, being the man of God he was, also had a way with children.